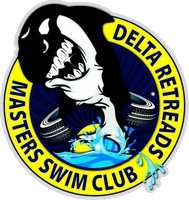 Delta Retreads Masters Swim Club Offers 3 professionally coached sessions per week and welcomes all swimmers age 18 and over. The club has been providing fun, fitness and participation to members since 1981! 2018/2019 Season started Thursday, Sept 13th and we are now in full swing, but we still have room for a few new members! Come on out and join us. Reminder to members (new and returning): You will need to print and sign a waiver and deliver it to Jan on the pool deck: To download this years waiver, retrieve it here. For those who are thinking of waiting for a while before joining: Please note that we allow a limited number of members to join later in the year (rates are appropriately pro-rated). Also, for those who are more interested in the social aspect of the club, there are limited "Social" memberships available ($110/yr). With social memberships, you can attend up to 6 sessions anytime during the year - and we look forward to seeing you at any of our social events (such as the Sunday Klatch). If you are considering joining and want more information, you get contact us via email or see if there are executive members you know from the community. Retreads is happy to welcome new members to the 2018-2019 season and we look forward to sharing club highlights with you. The club brochure, which is available in the lobby at Sungod, is also a geat resource. Member of Masters Swimming Canada (MSC) and Masters Association of British Columbia (MSABC).